This enhancement program takes effect on 01 JUNE 2012. 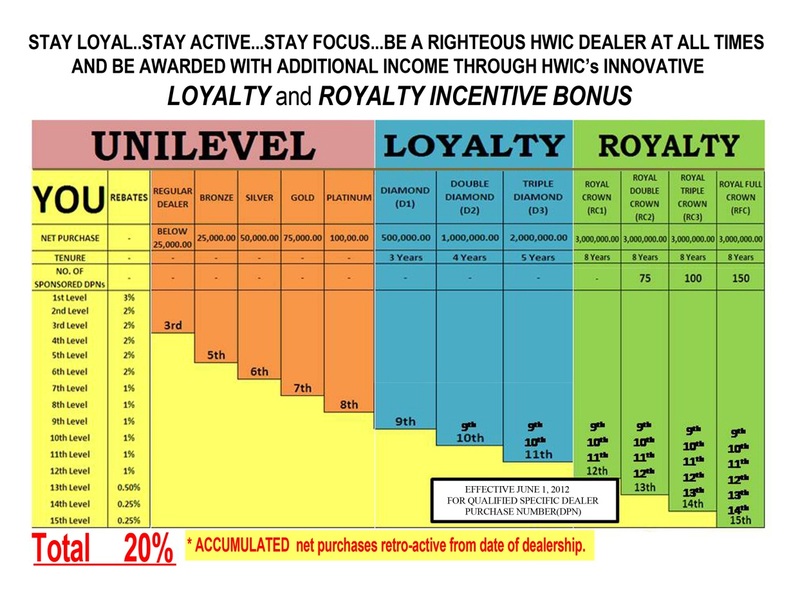 Hence, qualified HWIC Dealers shall receive their monthly additional monthly incentives starting 10 July 2012 and every month thereafter. Additional monthly incentive of 0.25% from 15th LEVEL PURCHASES PLUS 0.25% from 14th LEVEL PURCHASES PLUS 0.5% from 13th LEVEL PURCHASES PLUS 1% from 12th LEVEL PURCHASES PLUS 1% from 11th LEVEL PURCHASES PLUS 1% from 10th LEVEL PURCHASES PLUS 1% from 9th LEVEL PURCHASES.